Care2 Causes | Will FDA Restrictions Curb a Skyrocketing Rise in Teen Vaping? Will FDA Restrictions Curb a Skyrocketing Rise in Teen Vaping? High school and middle school teachers are deeply concerned about the number of young students who are turning to vaping. And they have good reason to be worried. Figures released by the Food and Drug Administration reveal that 3.6 million middle and high school students currently use e-cigarettes, up from 1.5 million a year ago. This number represents a 78 percent increase among high school students and s 48 percent increase among middle school students from last year. Now the FDA has announced new restrictions on the sale of flavored e-cigarettes and other tobacco products in a bid to curb the increase in underage smoking and vaping. The agency has also proposed banning sales of menthol cigarettes and flavored cigars. These are the most dramatic of such measures taken by the FDA in almost a decade. The new restrictions mean a ban on the sale of vaping products in retail outlets, such as convenience stores and gas stations. Now these products must be sold in adult-only locations, or they will have to be placed in a separate room — available only to over-18-year-olds. Additionally, there will be a ban on marketing for vaping products that targets teenagers. Vaping is the act of inhaling and exhaling vapor made from liquid heated in an electronic device. A vaping device has three main components: the fluid that is vaporized; an atomizer that heats up the liquid, turning it into vapor; and a battery that powers the atomizer. 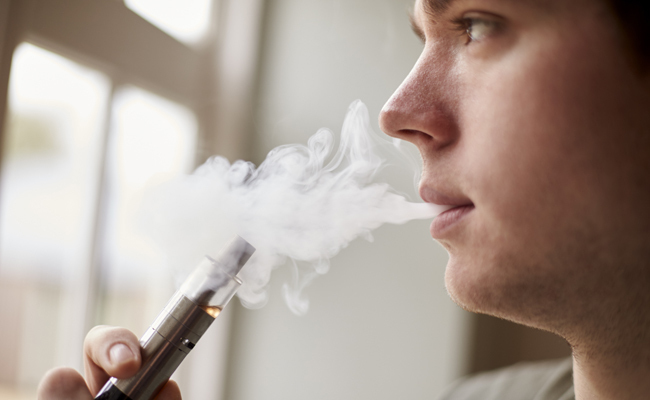 Many experts and, indeed, many teachers believe that the huge increase in teen vaping is due to Juul – a company that produces a liquid with a huge assortment of flavors, including crème brûlée, mango and bubblegum. About 72 percent of vaping products in the U.S. are now made by Juul, and each pod or flavor cartridge contains roughly the same amount of nicotine as a pack of cigarettes. JUUL also makes vaping devices that look just like USB drives, making it hard for teachers and parents to tell the difference. In which case, why has the company been actively promoting its product on social media sites? The epidemic proportions of teens and tweens who vape has taken both public health officials and educators by surprise. It is also highly dangerous: The presence of nicotine can cause physiological changes in the brain, particularly up to age 26. If the proposed FDA restrictions on vaping products are strictly enforced, they could go a long way in reducing nicotine addiction, which is spreading through our middle and high schools. However, the bans on menthol cigarettes and flavored cigars will be harder to enforce. Dr. Kenneth Warner, a public health professor emeritus at the University of Michigan has a different approach. “The science is very strong,” he maintains. “This is what the tobacco industry was saying a couple of decades ago about lung cancer – the science wasn’t strong enough. We must do all we can to reduce the number of young people vaping and smoking. I don't understand this fascination with vaping. Anyway, thanks for sharing. Vaping is much safer than smoking cigarettes and is great if you are an old smoker who wants to quit smoking but why on earth would young people who do not smoke take it up . Sure hope so.. - Vaping/smoking same difference,, you're still inhaling smoke/vapor that dries out your lungs, and can lead to lung cancer.. Here's another example of why pot should be legal everywhere. No nicotine, and no addicting properties. If I had kids I'd much rather they smoke pot than this crap. IT is very trendy to vape....even for the older crowd. Sadly, young people are more easily influenced by their peers.